Sri Lanka spinner Akila Dananjaya has been suspended from bowling in international cricket with immediate effect due to an illegal action. 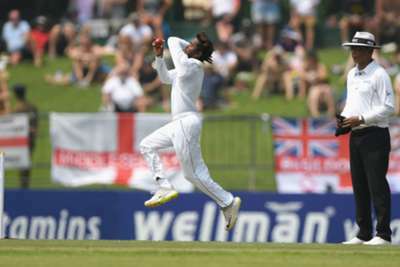 Dananjaya was reported by match officials during the first Test against England in Galle last month. He was given 14 days to respond to the charge, allowing him to play in the second Test in Pallekele before missing the series finale in Colombo. After an independent assessment held on November 23 in Brisbane, the International Cricket Council (ICC) announced the 25-year-old's deliveries exceeded the 15 degrees level of tolerance permitted. The ban covers all formats at international level, as well as domestic competitions outside of Sri Lanka. "In accordance with article 11.1 of the ICC regulations for the review of bowlers reported with suspect illegal bowling actions, Dananjaya's international suspension will also be recognised and enforced by all national cricket federations for domestic cricket events played in their own jurisdiction," the ICC confirmed in a statement. "However, according to article 11.5 of the regulations and with the consent of the Sri Lanka Cricket, Dananjaya may be able to bowl in domestic cricket events played under the auspices of the SLC." The ICC also confirmed Dananjaya can apply for a reassessment after modifying his action in accordance with clause 4.5 of the regulations. BREAKING: The bowling action of Sri Lanka spinner Akila Dananjaya has been found to be illegal. He has been suspended from bowling in international cricket with immediate effect.